Libbys on the Loose:2 Humans. 2 Great Danes. 1 RV. : Our first RV damage: We knew it would happen sooner or later! 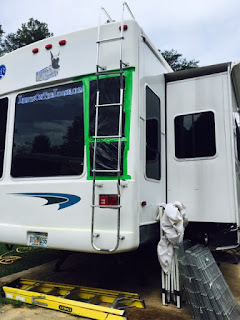 Our first RV damage: We knew it would happen sooner or later! It pretty much goes without saying that anytime a "new" piece of equipment is purchased (especially one that the familiarity or experience is absent), the probability of an "oops" is inevitable. I certainly didn't think that we were exempt from this, but after a few months of getting the fiver in and out of a number of tight spots free of damage, our level of confidence in our abilities was pretty high! But the day came. After spending over a month in Charlotte, NC, the RV park that we were staying was unable to offer us a spot through the dates we needed. So, in the interest of escaping to higher elevation and being in closer proximity to Asheville, NC, which we both were dying to visit, we decided to find another site to set up shop for a week or two. In addition to that, one of our favorite bands, JJ Grey and Mofro was playing at Pisgah Brewing Company, so we wanted to find a place as close as possible, but still being relatively close to Charlotte since Jeanine was still going two times weekly for physical therapy. Enter Sky Island Retreat RV Park and Campground. 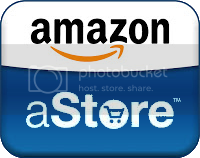 If you haven't read the review, it's worth the couple minute read. While we had no complaints about the staff, service, or location, it is a little bit difficult to get in and out of. First off, if you plan to visit this spot, take the time to either call the campground and talk to one of the staff to get directions (probably Debbie). Reason being: The GPS directions will try to take you in through the back (now closed) entrance, which, from what we understood, was significantly more difficult to get into than the way we (eventually) entered. After getting turned around a few times (they admittedly needed to update their website directions) due to the failure of instructions to make a right off the interstate, we finally found the entrance. Getting in was easy providing you came from the correct way! The entrance is a bit narrow so you'll want to take it easy going through the "gates". They are a bit narrow. Once you pass the CaddyShack mini golf course, you'll see the office straight ahead at the bottom of the (pretty) steep hill. I decided that since we didn't know what site was ours yet, that it would be best to just pull straight forward into the office parking lot. In my mind, it would be easy to back straight out and partially back up the hill. And, in theory, that should have been what happened. Unfortunately, due to a lack of rear vision and my confidence gained in trailering, upon backing up, our beautiful 36' Holiday Rambler was no longer without a scratch. I swear, that damn tree just jumped out in the middle of the road! Someone failed to tell me that the road had shifted about three feet in the opposite direction to where I was backing! It probably wouldn't have been so back had I stopped when I met resistance. I was under the impression (and was correct!) that the trailer metal stops in the rear wear just dragging (like they're supposed to) on the driveway. So, in an effort to 'get past' the spot they were hung up on, I pressed harder in reverse. Crash. That's about all it took. 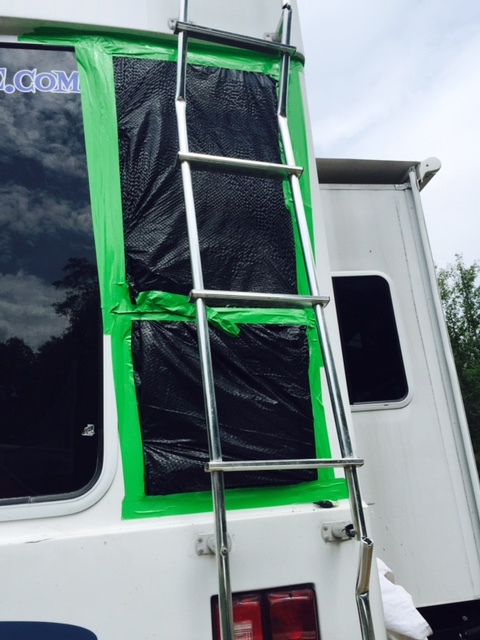 Two pieces of window glass, our rear ladder, and a bottom portion of the passenger side fiberglass was cracked. As luck would have it, rain clouds gathered overhead and very quickly started lightly raining. After assembling a few trashbags and some (cheap) duct tape, I was able to seal up the hole created by the lack of window glass. 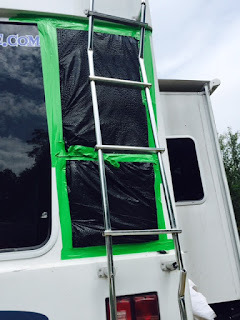 This wasn't the best solution, but it would prove watertight until we found a better way - carpet protection tape. This roll of plastic sheeting with adhesive on one side (used to cover and protect carpeting) proved perfect for making a watertight seal both on the inside and outside of the window. We will be keeping a roll handy! Needless to say, after sealing up the window, I was still more than pissed. I am not a professional trailer driver by any means, but I have driven quite a few miles and backed up what seems like a million times, but when you damage your 'new toy' it's difficult not to bruise your ego at the same time. My pride was hurting a bit - especially because I didn't have Jeanine spot me when backing up. I guess I got a little too confident. Being the good wife she is (and since it was after 5 o'clock), she decided the answer to repairing my pride was somewhere at the bottom of a very expensive bottle of tequila we brought back from Mexico. It was just what the doctor ordered! All told, according to our awesome Geico representative the damage tallied to just over $3000 in damage (seriously, we've been with Geico for over 20 years - love them!). 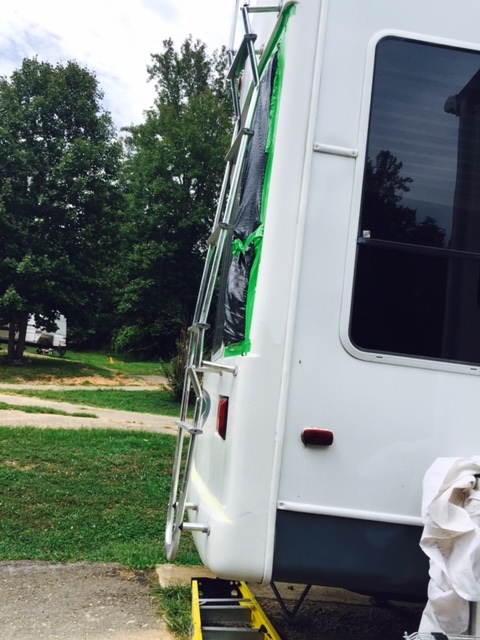 Had it not been for the cracked fiberglass, the bill would have stayed quite a bit lower, but due to having to repaint, blend, and the associated labor with removal and reassembly of parts, the tab quickly soared. Although disappointed, at the end of the day, that's what insurance is for - in case s*#@ happens! One this particular warm day in July, that did indeed happen. Though unfortunate, it didn't ruin our great time at this great place - we still highly recommend it! Laughing as I read this. My husband did the same thing. Small bump and $4700 later our toy is all better but his ego took a hit!